AATSISTA-MAHKAN (Running Rabbit), Blackfoot warrior, the leader of the Biters band, and a head chief of the tribe; b. c. 1833 in what is now central Alberta, son of Akamukai (Many Swans); had four wives and eleven children, the most prominent being Duck Chief, who later became a head chief; d. January 1911, probably on the 24th, on the Blackfoot Indian Reserve, Alta. 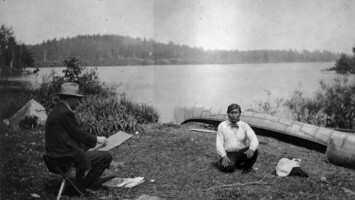 Hugh A. Dempsey, “AATSISTA-MAHKAN,” in Dictionary of Canadian Biography, vol. 14, University of Toronto/Université Laval, 2003–, accessed April 24, 2019, http://www.biographi.ca/en/bio/aatsista_mahkan_14E.html.